Can I access Edinburgh Dungeons with a cast/air-boot/splint? Is The Edinburgh Dungeon fully accessible? Do you have disabled toilets at The Edinburgh Dungeon? Can I bring an assistance dog into The Edinburgh Dungeon? Is The Edinburgh Dungeon suitable for someone who suffers from epilepsy? 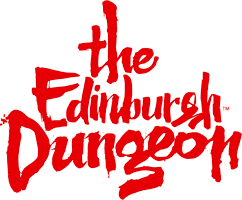 Is The Edinburgh Dungeon suitable for someone with a hearing impairment? Is The Edinburgh Dungeon suitable for visually impaired guests? Please note that strobe lighting is currently used in 3 shows on the tour: Castle Ghosts, Boat Ride, and Drop Dead Drop Ride. As such, these shows aren’t recommended for guests suffering from epilepsy. Health warning signs are visible at the entrance to the attraction and warning are given at the beginning of both rides. An alternative route will be provided for those who need to bypass these areas. Please alert a member of staff if you have any concerns and they will assist you. Do you offer discounted rate for School Trips to visit The Edinburgh Dungeon? Are there any restrictions for wheelchair users at The Edinburgh Dungeon?